This week all eyes of the art world are in Basel – a small Swiss city, located where the German and French borders meet, attracts the leading gallerists, collectors, art enthusiasts and representatives of both public and private arts organisations. Read our subjective guide to what’s worth seeing… and don’t forget to visit the magazine section at Art Basel (next to the Unlimited section) and LISTE – Art Fair Basel where our Contemporary Lynx Magazine is waiting for you. In 1970 Basel gallerists Ernst Beyeler, Trudl Bruckner and Balz Hilt create an international art fair that proves to be a success from the start. More than 16,000 visitors attend the inaugural show to see 90 galleries and 30 publishers from 10 countries. Photo: Kurt Wyss. 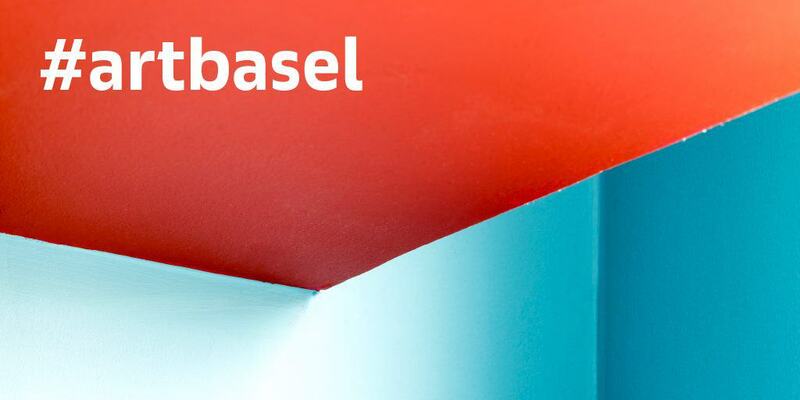 This year Art Basel in Basel brings the international art world together, with 290 of the world’s leading galleries showing the works of over 4,000 artists. Exhibitions and events are also offered by cultural institutions in Basel and the surrounding area, creating an exciting, region-wide art week. To help you plan your time in Basel, we selected the top events and places. Like always, the Starmach Gallery will present its works in the Art Galleries section on the ground floor. Adhering to its profile, the gallery featured the classic works of Polish artists whose names are very well-known both in Poland and abroad. This year we can expect works by Magdalena Abakanowicz, Edward Krasiński, Ryszard Winiarski. The gallery usually opts for the abstract geometry and its main exponent Henryk Stażewski, whose works were also displayed on this show. We know that this year Skira publishing house will release their new publication dedicated to this Poland’s most prominent artists. The owner of the gallery Andrzej Starmach will present 3 sample copies of this book during the fair. Although conventionally the sector 2.0, situated on the ground floor, exhibits the classics only and the sector 2.1 is available for the galleries which represent newly emerging artists, the stand of the Foksal Gallery Foundation will featured the early works by Edward Krasiński and Erna Rosenstien side by side with the ones created by artists of a next generation who have already established their strong position on the market, such as Monika Sosnowska, Paweł Althamer, Wilhem Sasnal, Jakub Ziółkowski. 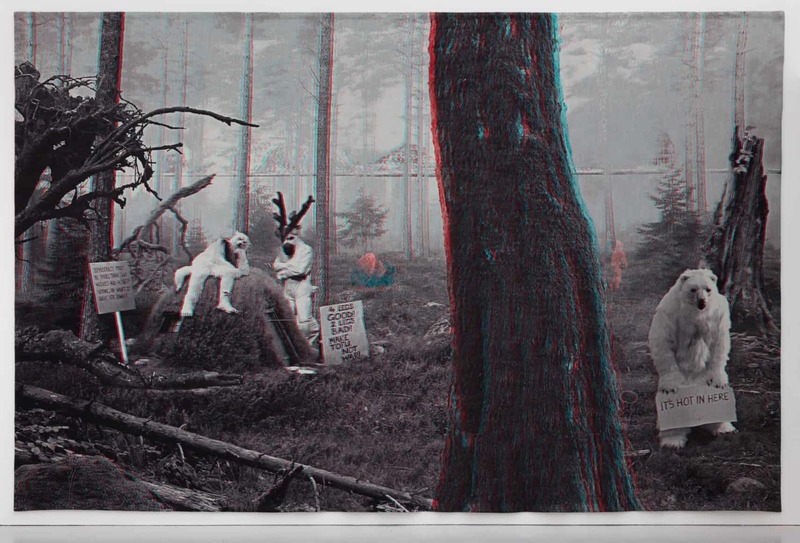 The first of a new series of 3D tapestries designed by Goshka Macuga features an imaginary scene in an old forest, possibly in the north of Europe, where a group of people dressed as animals (wolf, reindeer and a polar bear) appear to have gathered together after their participation in a protest. Their banners seem to respond to environmental issues as well as political ones. The landscape in the far background references the Tower of Babel which, when coupled with the animals and the water, is also suggestive of Noah’s Ark and a vision of the possible future. The tapestry incorporates futuristic references such as the use of 3D, and a space program represented by a cosmonaut and space capsule. When placed alongside manifestations of today’s environmental and political debates in the form of protest banners, these symbols create confusion in the temporality of the scene. The 3D effect mimics a past understanding of an image of the future, while the animals refer to a long tradition of depicting animals in order to represent or symbolise human characteristics. In 19th century cartoons published in magazine editorials, animals were featured as political symbols in order to influence voters by distilling complex ideas into more humorous illustrations. The banners in the tapestry reference stories such as Orwell’s Animal Farm and Aesop’s Fables, where animals play the protagonists, embodying human traits. Whilst mimicking another species, the protesters are accepting the social values of progress and the dominion of human over nature. By identifying with the non-human in the form of animals, they also “dis-identify” with the destruction of our natural environment and animal suffering caused by humans. These animal protesters can also be seen to relate to the ‘furry fandom’ movement – a subculture interested in fictional anthropomorphic animal characters with human personalities and characteristics. Furry fandom traces its origins to a science fiction convention in 1980 where it claimed to unite its members in finding a place of belonging. Make Tofu Not War is not aiming to represent the past, present or the future but rather opens up a platform to speculate about many possible ideas and outcomes of today’s current landscape. Wacław Szpakowski, A000000, 1927, ink on transparent paper, Galerie Berinson, detail. Since its inception in 1996, LISTE has developed into one of the most important fairs for mostly new, but also to some extent a middle generation of galleries. LISTE focuses on introducing young galleries with primarily emerging, as yet little-known artists. This year the selection committee – composed exclusively of museum experts and artists – has selected 79 galleries from 32 countries from over 250 applicants. At the magazine section you can find our magazine. So have a look and grab the latest issue. What’s more, in the next few days we will provide the interview with Peter Bläuer, its founder and longtime director who after the fair will retire. He will now become vice president of the fair’s board… So stay tuned! At this year’s LISTE Art Fair in Basel (June 11–17), Raster is showing the works of three artists linked by the performative nature of their technique: Oskar Dawicki, Honorata Martin, and the Slavs and Tatars collective. The radical on-camera actions by Honorata Martin will have their premiere at the fair. Dawicki will show a series of drawing objects relating the dilemmas of creative balance for a performance artist. The show will also include objects by Slavs and Tatars from the Pickle Politics cycle. 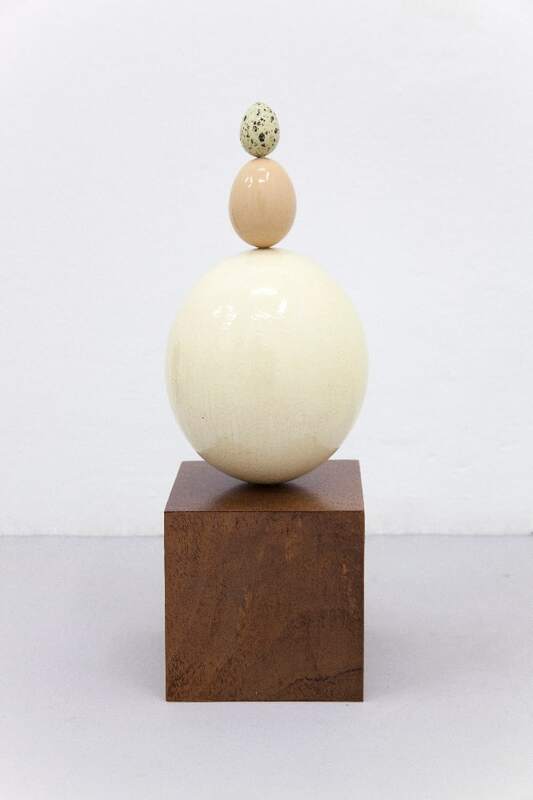 Stereo – Warsaw-based gallery, launched by Zuzanna Hadryś and Michał Lasota will present works by Jakub Czyszczoń. We’re looking forward to see Katarzyna Przezwańska (b. 1984) works at Dawid Radziszewski stand. In her practice, she often refers to nature and architecture. She combines both of these fields, always striving to improve the quality of human life and trying to make her art entirely utilitarian. The artist is equally inspired by vernacular architecture and classical architects of the twentieth century, as by the vegetation of plants or large geological phenomena. She creates architectural interventions, installations, paintings, often using natural materials such as rocks, minerals or plants. We also have something for art book lovers. 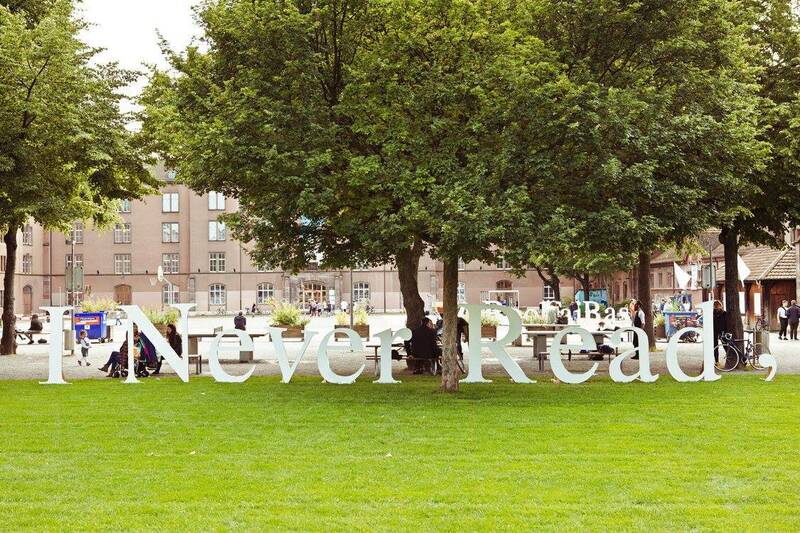 The next edition of I Never Read, Art Book Fair Basel will take place from 13-16 June 2018 at Kaserne Basel. It focuses on printed matter, gathering around one hundred national and international, institutional and independent publishers. Alberto Giacometti (1901-1966) and Francis Bacon (1909-1992) had a decisive influence on the art of the twentieth century. This exhibition brings the two artists together for the first time. Different as their art may initially appear, the joint presentation of their work reveals many surprising similarities. Bacon and Giacometti both take the human figure as their main point of artistic reference. Both occupy themselves with the fragmented and deformed body. Moreover, they devote themselves to portraiture and the depiction of human individuality in an almost obsessive manner. Both claimed to be “realists,” while exploring new extremes of abstraction. Giacometti and Bacon worked surrounded by clutter, in exceptionally small and cramped studios. These two spaces, the centers of their creativity, have been reconstructed specially for the exhibition as full-scale multimedia projections that provide a vivid insight into the artists’ work environment. The exhibition comprises 100 paintings and sculptures from major museums and private collections in Europe and the USA. It has been organized by the Fondation Beyeler in cooperation with the Fondation Giacometti, Paris, the administrator of the artist’s estate, which has made available most of the works by Giacometti presented here, some of which are rarely exhibited or have never been publicly displayed before. The exhibition is curated by Catherine Grenier, Michael Peppiatt and Ulf Küster. 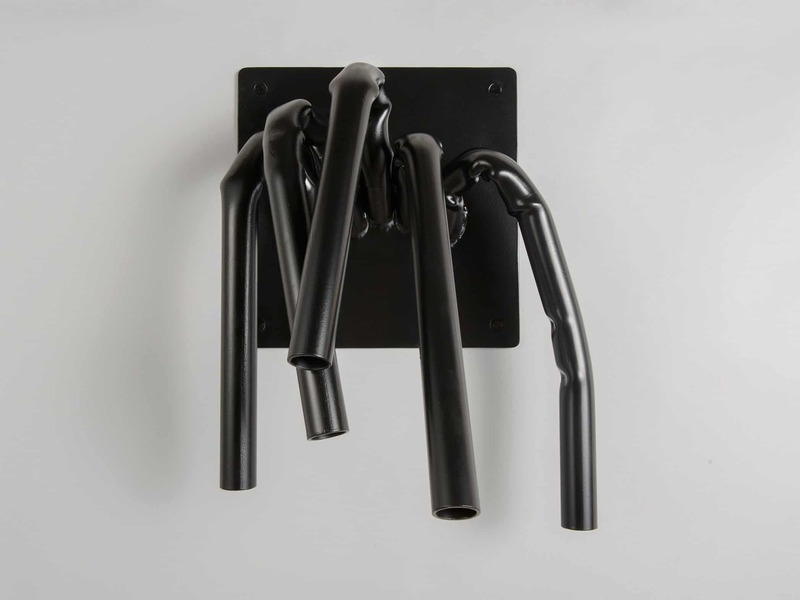 This exhibition, Hershman Leesons’s first solo show in Switzerland, features several current works that take on the themes of biological progress, developments in artificial intelligence and scientific research on antibodies. Australian composer and producer Ben Frost performs an exclusive concert at HeK. His live performances fuse intensely structured sound art with militant post-classical electronic music. Sam Gilliam (b. Tupelo, Mississippi, 1933) is one of America’s most prominent abstract painters. Gilliam’s signature creative achievement is the drape paintings series, begun in 1968, for which he applied the same procedure as in the beveled-edge paintings but then released the canvas from the stretcher frame. Unlike easel paintings, which usually function independently of their context, the drape paintings evince a performative aspect and interact with their respective settings; they can be installed in a variety of ways depending on the spatial context. The Music of Color also probes the political and historical dimension of Gilliam’s oeuvre. While the artist himself rarely comments on political issues, the works in his Martin Luther King series and Jail Jungle reflect the 1968 race riots and the highly polarized debate over black art and abstract painting in 1960s and 1970s America. The Kunstmuseum Basel presents 45 outstanding works from public and private collections in Europe and the United States.